If you've never been presented with a bowl of cha chiang mian, it could easily look to you as if someone had drowned a perfectly good tangle of noodles in crude oil. But to Koreans, the various iterations of these wheat noodles in thick, inky black bean sauce with chopped vegetables and meat represent the very definition of familiarity and comfort. They're the Asian analog of chicken noodle soup or meat loaf with mashed potatoes and gravy. Koreans use cha chiang mian as a treat and a painkiller: children are rewarded with it for their accomplishments, and every April 14, on Black Day, lonely singles gather in restaurants and pine for love over steaming bowls of the stuff. So it's something of a surprise that cha chiang mian (sometimes spelled ja jang myun, jajangmyeon, or a variety of other ways) is not a true Korean dish but rather the most recognized preparation of an offshoot of Chinese cooking acculturated to Korean tastes—much the same way that Chinese food in America has developed into its own cuisine, bearing little resemblance to anything you might actually eat in China. In addition to cha chiang mian, Chinese-Korean food is known for a spicy seafood noodle soup called champong, the sweet-spicy-sauced deep-fried chicken wings called gampongi, and a nonfluorescent and not so cloying version of sweet-and-sour pork called tan su yuk, as well as less common dishes like nanja wanseu, deep-fried meatballs with mushrooms and vegetables in a spicy soy-based sauce, and liang jang pi, a cold composed salad of seafood, vegetables, and pork dressed with a hot mustard sauce. According to cultural anthropologist Yang Young-Kyun, Korea's first restaurant owners were Chinese who cooked almost exclusively for their fellow immigrants—most from China's eastern Shandong province, just across the Yellow Sea. 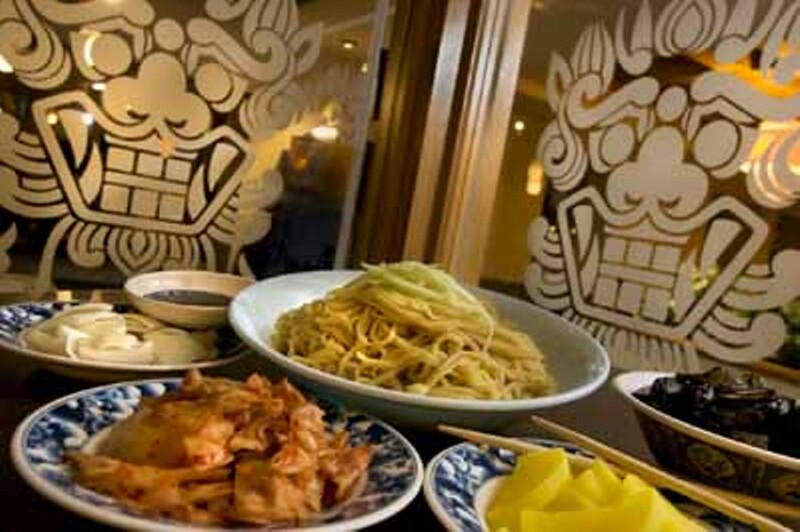 At first, in the late 19th century, only a few wealthy Koreans ate in these restaurants, but as the society evolved from primarily agrarian to more industrialized, more natives were exposed to restaurant culture and Chinese food was adapted to the Korean palate. This hybrid cuisine began finding its way to the U.S. in the 70s and early 80s, as Chinese-Koreans—or Shandong ren—joined a wave of Korean immigration to major cities and opened restaurants. Evidence of this migration can be found in a half dozen or so Chicago-area restaurants where Shandong ren (and some Koreans) continue to serve Koreanized Chinese food alongside typical Chinese-American dishes. At Albany Park's beloved Great Sea (3254 W. Lawrence, 773-478-9129), the hard-fried gampongi inspire rapture among the neighborhood's many ethnicities, but it's the cha chiang mian that keeps Koreans coming back. Karen Lim, who owns the Pilsen Korean chicken joint Take Me Out, says her parents opened Great Sea in 1988 after operating a place in Seoul. Every morning they make a new batch of dough for the noodles, which is then portioned, rolled, cut, and boiled to order. House-made noodles cooked to order are a point of pride with most of the restaurateurs mentioned here. Gone are the days of hand-pulled noodles—they all use electric pasta machines now. But the freshness of the dough still makes for lengthy, chewy, tentacular noodles that are best slurped rapidly—which results in an unfortunate spattering of tiny brown sauce stains on table and bib unless they're cut to a manageable length. Some places provide diners with scissors for just this purpose. In Chinese-Korean restaurants the varied spread of panchan that comes with a typical Korean restaurant meal is replaced by a quartet of kimchi, yellow pickled daikon (danmuji), raw onions, and a dollop of uncooked fermented bean paste called, at this stage, chun chiang—you dip the onions in it. The cooked noodle sauce, made with the same paste, is known as cha chiang, and it tastes faintly sweet, deep and earthy but mild—some would say bland. There's usually a bottle of white vinegar and a shaker of red chile powder at the table to liven things up. The "Chinese Korean Style" menu at Chang's (3718 N. Elston, 773-588-6906) offers ten house-made noodle dishes, four of which are variations of cha chiang mian. Basic cha chiang mian employs a thin sauce, cooked with ground or chopped pork (or sometimes beef), with chopped onions and other vegetables, such as zucchini, cabbage, carrots, or potatoes. Sam sun cha chiang mian adds three kinds of seafood—some combination from a choice of scallops, shrimp, squid, or sea cucumber. Gan cha chiang mian has a thicker, chunkier sauce that's usually cooked to order and served on the side, which leaves the veggies crisper and fresher. Sa chun cha chiang mian is amped up with chile powder. At V.I.P. Restaurant (3254 W. Montrose, 773-588-2727) you can order gan cha chiang mian in a double-sided bowl with spicy champong (see video on the Food Chain). Peking Mandarin (3459 W. Lawrence, 773-478-5338) has one of the chunkiest sauces I've run across, with big cubes of pork and onion, shrimp, scallops, and sea cucumber. I love the atmosphere of all these places—the sort of dim, faded, red-dressed ambience of the prototypical Chinese-American restaurant. Chang's even serves classic tropical drinks like mai tais and fog cutters in tiki-style glasses. 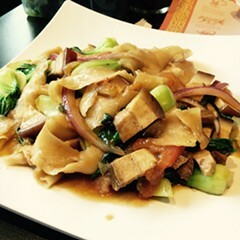 But my favorite version of cha chiang mian comes from the large, modern Great Beijing (6717 N. Lincoln, Lincolnwood, 847-673-5588), which has the most extensive Chinese-Korean menu of the places I surveyed, and where the noodles in the Three Flavor Chachiang Mein are extra chewy. At Chinatown's Cantonese-Mandarin Cantonesia (204 W. Cermak, 312-225-0100) the cha chiang mian is made in the original non-Koreanized Shandong style. Aside from a garnish of zucchini and cilantro there are no vegetables, and the pork is finely minced in a lighter, saltier sauce made from soybean paste instead of black bean paste. Less copious than the Korean sauce, it integrates well with the noodles when it's mixed. Care to comment? Find this column at chicagoreader.com. And for more on food and drink, see our blog the Food Chain.